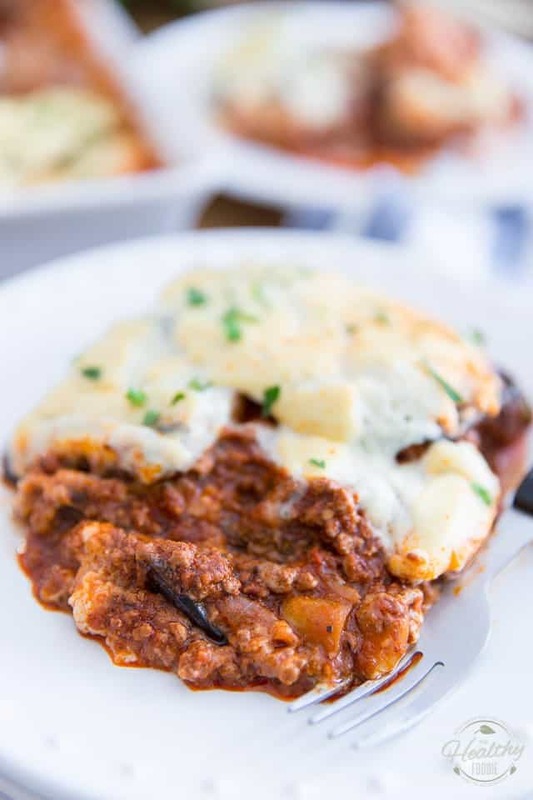 As comforting and delicious as it is good for you, this gluten free moussaka, or kicked-up eggplant lasagna, is sure to warm you from the inside out! Moussaka is probably one of my ultimate favorite comfort foods of all times! 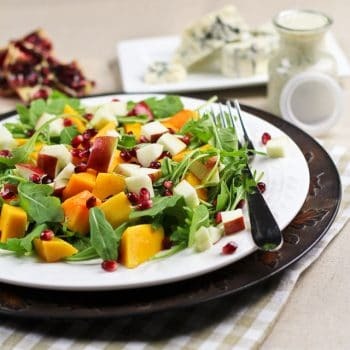 Unfortunately, it also happens to be one of those dishes that’s just darn near impossible to portray in a way that makes it actually looks as good as it tastes. 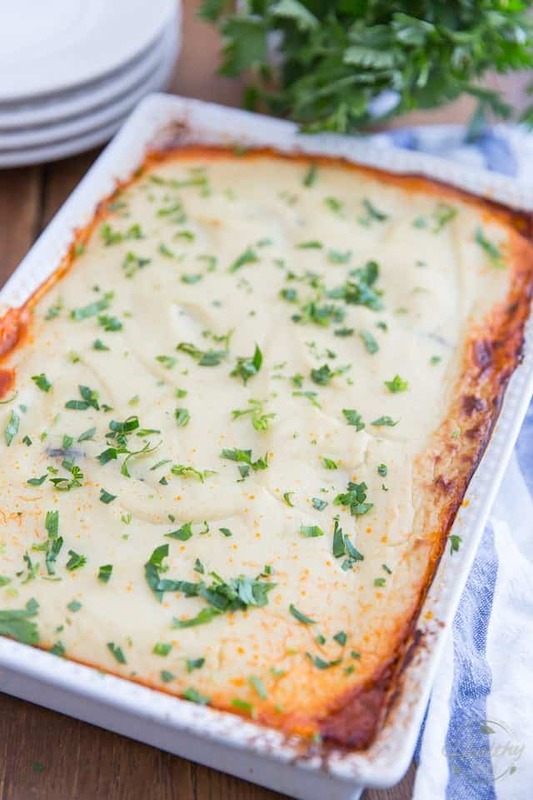 But trust me… this Greek style eggplant lasagna is insanely delicious! I think I even prefer it to traditional lasagna… It’s a creamy, dreamy and incredibly tasty concoction;. 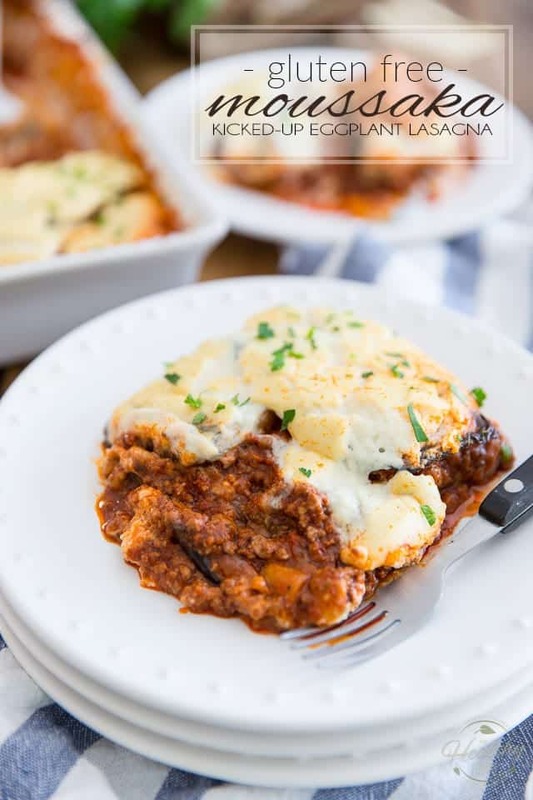 you’re looking at layers of soft and tender baked eggplant, sandwiched between loads of ground lamb in a tasty tomato sauce, and topped with a rich, cheesy bechamel sauce. Can you say yum? 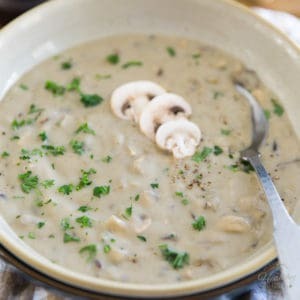 For my part, though, since I find that most bechamel sauces tend to call for way too much butter and flour to meet my own personal healthy standards, especially if you’re going to also add a fair amount of cheese to it, I like to reach for my secret weapon to make my bechamel sauce: cauliflower. If you’ve never tried it, lemme tell you, it’s absolutely brilliant for this task! 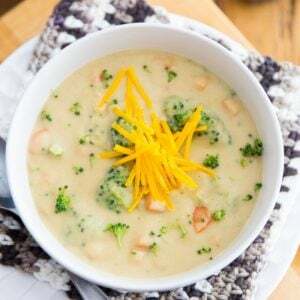 And if you decide to give this recipe a try, you’re about to find out, too! First, preheat your oven to 400°F. 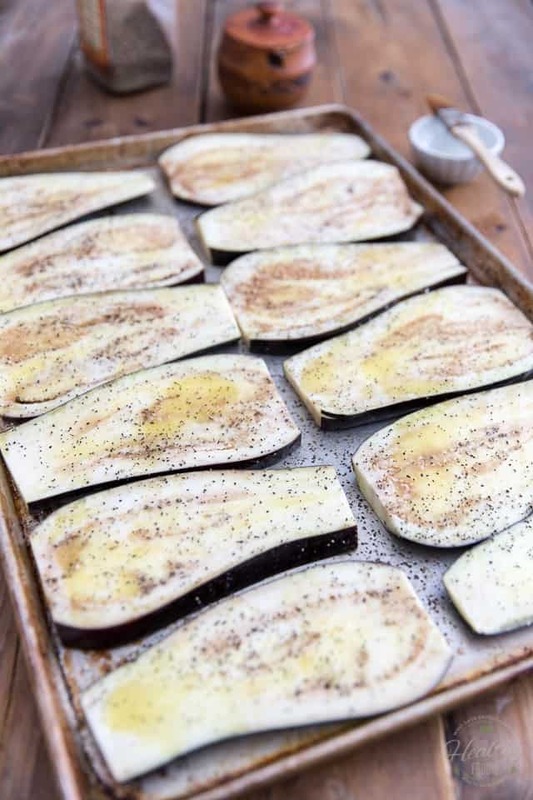 Then, brush a large 18″ x 26″ baking sheet with a little bit of olive oil and arrange the slices of eggplant on it. Brush the tops of the slices with a little bit more olive oil, sprinkle them generously with salt and pepper and bake this in the preheated oven for 15-20 minutes; You’ll want to flip the slices once about halfway through cooking, and then leave them in there until the eggplant is softened and slightly golden. Heat some olive oil (or your preferred cooking fat) in a large saute pan set over medium-high heat. 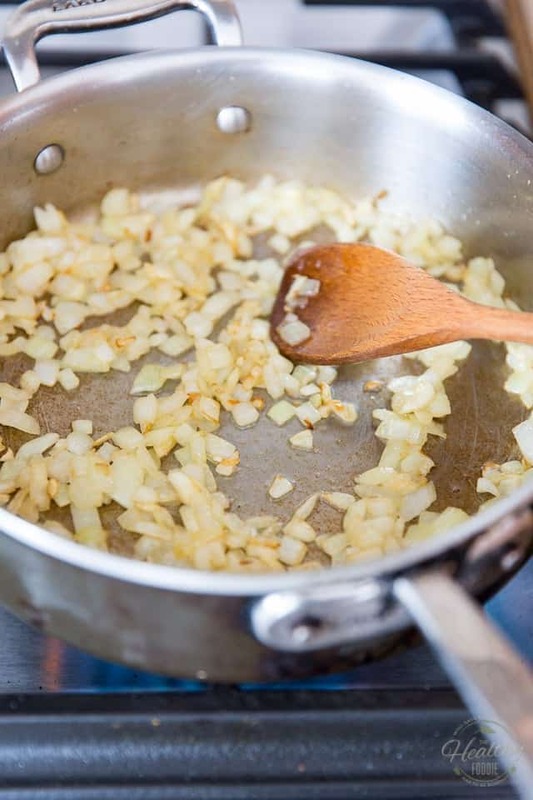 Add the onion and garlic and cook them until fragrant and slightly browned, about 3 to 4 minutes. Add the ground lamb and salt and continue cooking, stirring from time to time and breaking the meat as you go, until the lamb is no longer pink, which should take about 5 minutes. 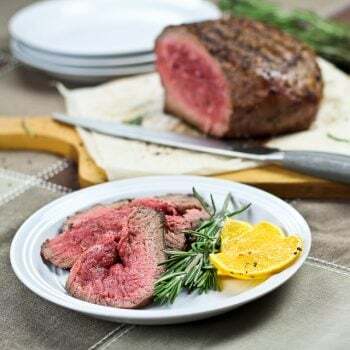 If you’re not a fan of lamb, feel free to use beef, or veal, or any ground meat that you prefer. Next, add the crushed tomatoes, water (if you happen to have some bone broth lying around, by all means, feel free to use that instead of water; red wine would be amazing, too! ), dried oregano, black pepper, cinnamon and allspice; stir well, cover loosely lower heat and simmer for about 15 minutes. Don’t forget to check on your eggplant! 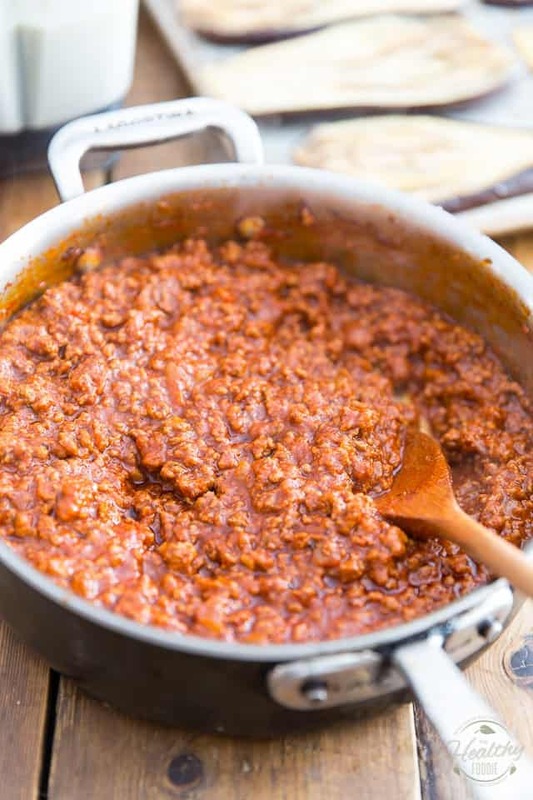 While the meat sauce is simmering, place the cauliflower florets into a steam basket and cook them over salted boiling water until they are really tender, about 8 to 10 minutes; remove from heat and let cool slightly. 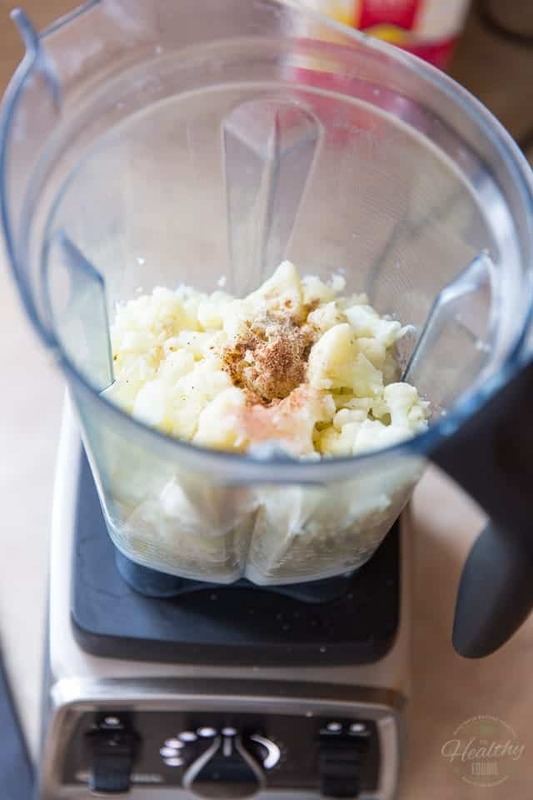 Now carefully transfer the cooked cauliflower to a high-speed blender; add the milk, salt, white pepper and nutmeg and process on high speed until smooth and creamy. While the motor is running, add the egg yolk trough the feeding hole in the lid and continue to mix until it’s fully incorporated. 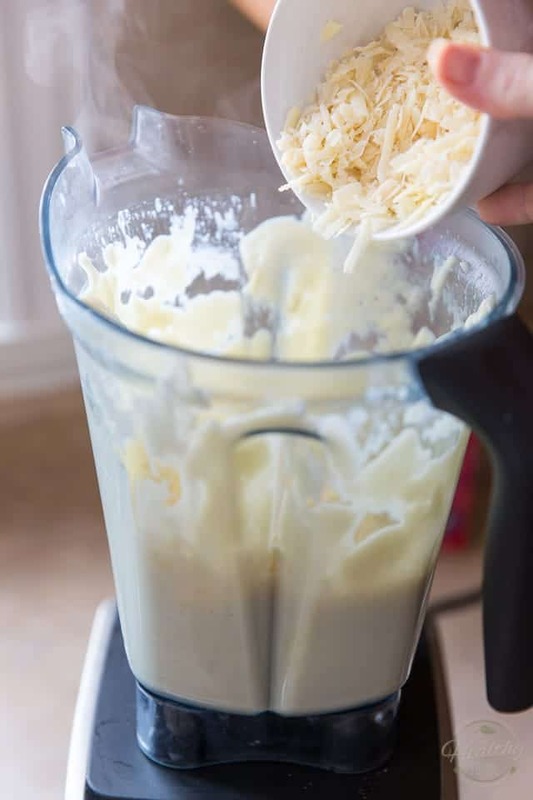 Once the yolk has been mixed in, remove the lid, add the grated cheeses and then resume processing until they too, are completely incorporated, about 15 seconds. Alright, now time to assemble all these yummy components and turn them into Moussaka!! 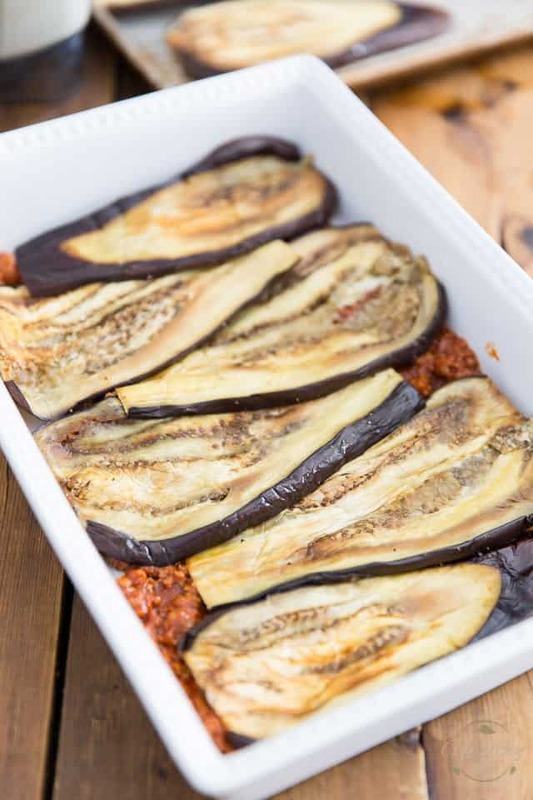 By now, your eggplant slices should be out of the oven and should have had ample time to cool, so you can safely handle them with your bare fingers. And your lovely lamb filling should have simmered plenty, so it’s gotten all kinds of thick, is looking all rich and meaty and is filling the house with the most intoxicating aroma! 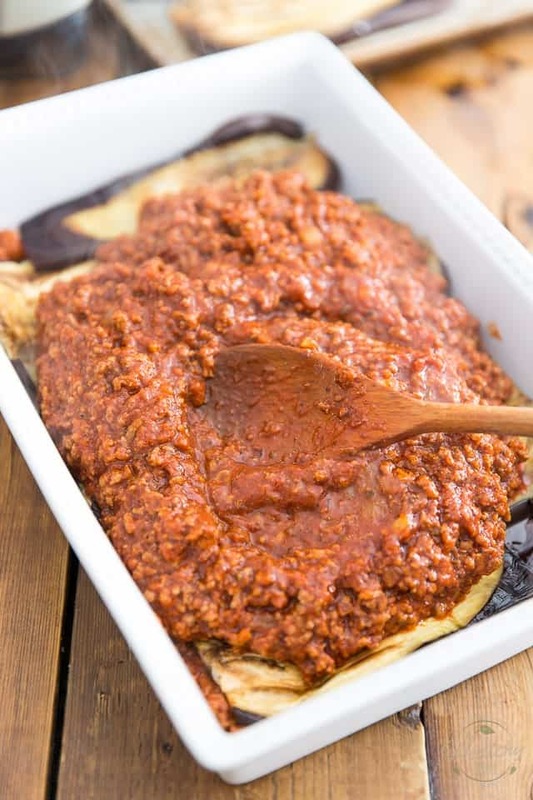 So, start by spreading about one third of the meat mixture at the bottom of a 9″ x 13″ baking dish, and then arrange half of the eggplant slices over it. Continue layering with the remaining slices of eggplant, and then cover them with all of the “cauli-bechamel” sauce. Now bake your moussaka at 350°F for 40 to 45 minutes, or until the top gets slightly golden, especially around the edges. Let the moussaka stand for at least 10 to 15 minutes before serving and garnish it with a handful of chopped parsley, if you so desire. 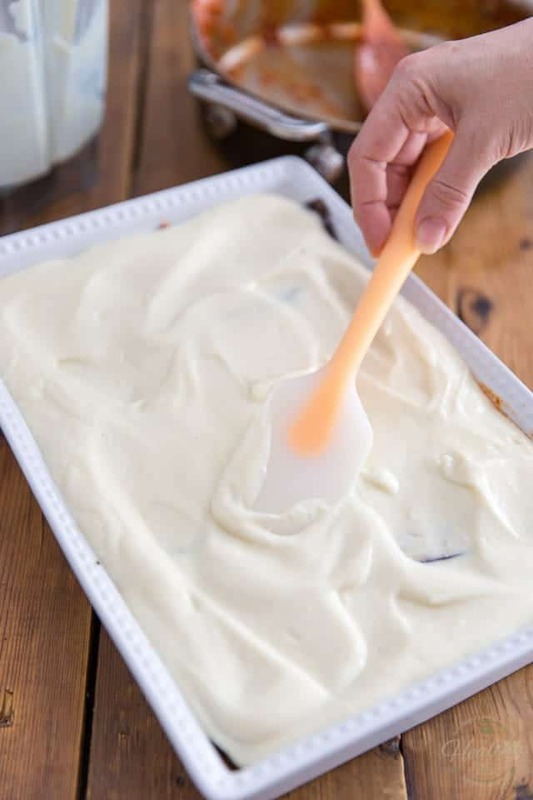 To serve, slice with a sharp chef knife, but don’t expect miracles… unless you were to refrigerate your moussaka completely before slicing it, you’ll have a very hard time making it look all neat and pretty. But who cares, really; I swear you’ll forget all about looks as soon as you’ve grabbed the first bite! 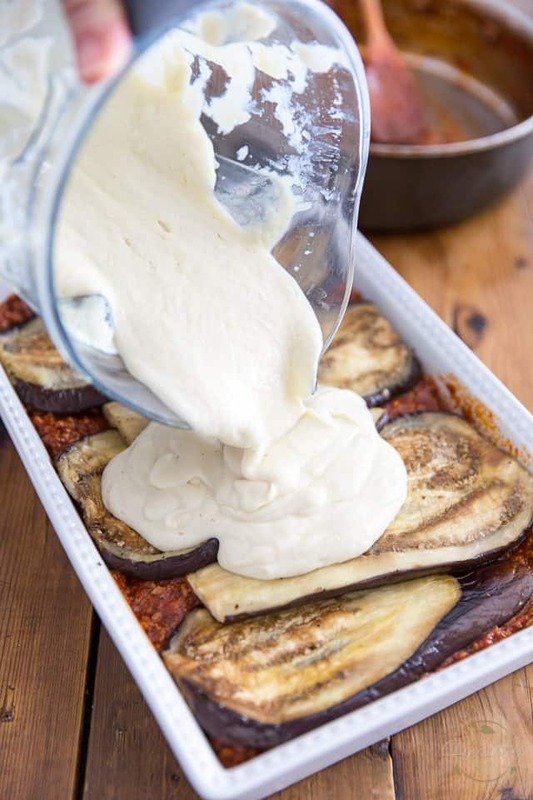 As comforting as it is good for you, this gluten free moussaka, or kicked up eggplant lasagna, will warm you from the inside out! 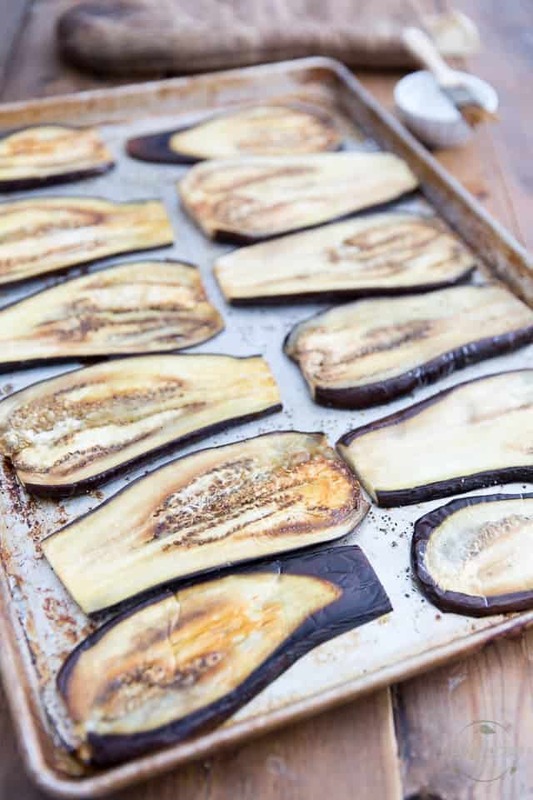 Brush a large 18" x 26" baking sheet with a little bit of olive oil and then arrange the eggplant slices on it. While the eggplant is baking, heat some olive oil (or other cooking fat of your choice) in a large saute pan set over medium-high heat. Add the onion and garlic and cook until fragrant and slightly browned, about 3 to 4 minutes. 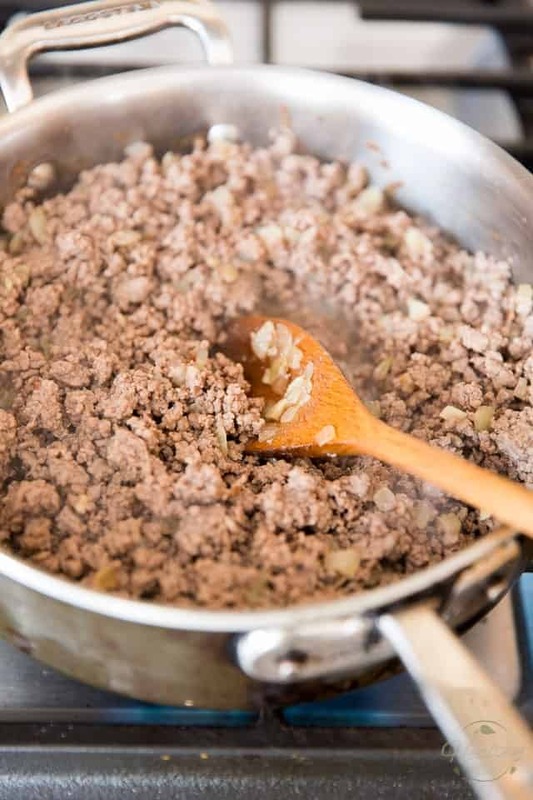 Add the ground lamb and salt and continue cooking, stirring from time to time and breaking the meat as you go, until the meat is no longer pink, about 5 minutes. 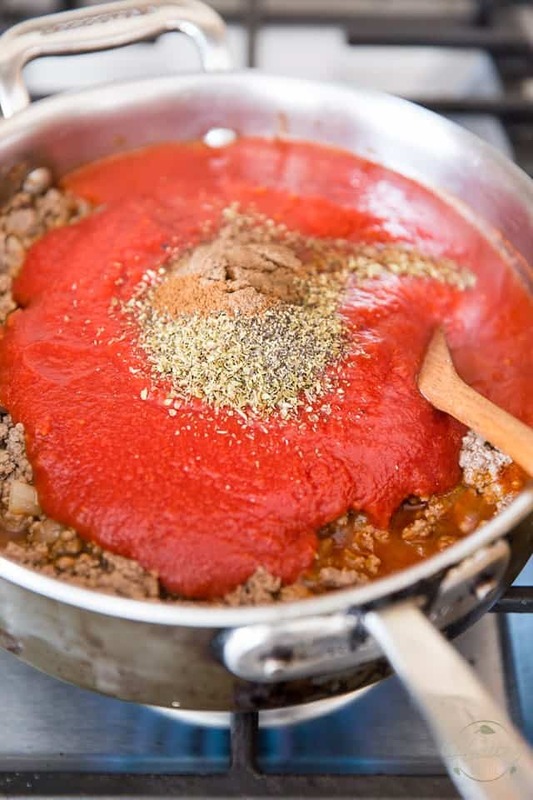 Add the crushed tomatoes, water, dried oregano, black pepper, cinnamon and allspice; stir well, cover loosely lower heat and simmer for about 15 minutes. 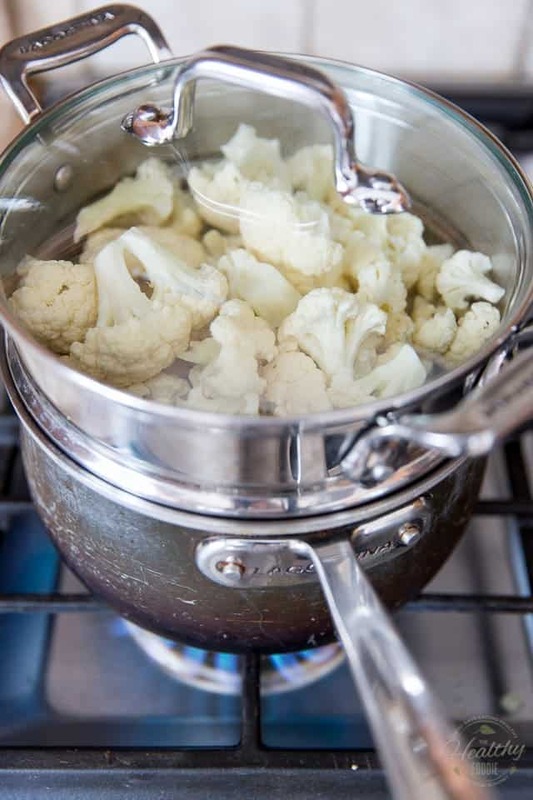 While the sauce is simmering, place the cauliflower florets into a steam basket and cook over salted boiling water until really tender, about 8 to 10 minutes. Remove from heat and let cool slightly. 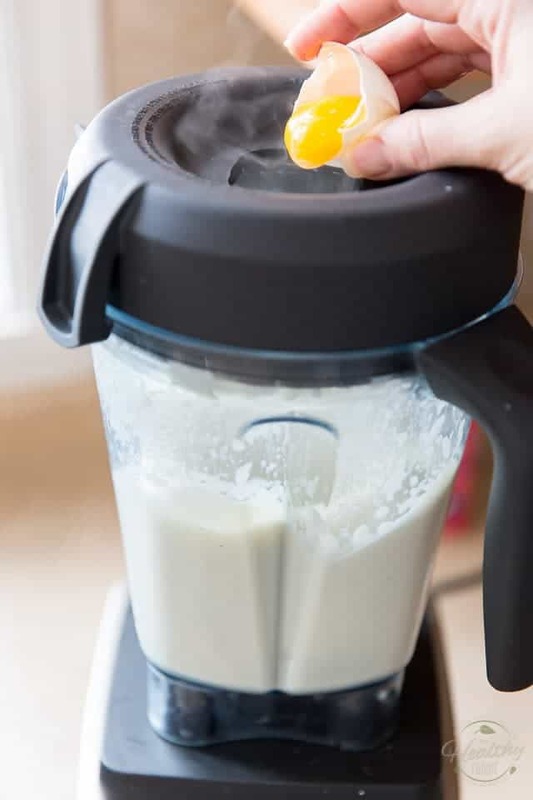 Carefully transfer the cooked cauliflower to a high-speed blender, add the milk, salt, pepper and nutmeg and process on high speed until smooth and creamy. While the motor is running, add the egg yolk trough the feeding hole in the lid and continue to mix until it's fully incorporated. Remove the lid, add the grated cheeses and then resume processing until it's completely incorporated, about 15 seconds. Spread about 1/3 of the meat mixture at the bottom of a 9" x 13" baking dish, then arrange half of the eggplant slices over it. Top with the rest of the meat mixture, followed by remaining slices of eggplant, and finally, all of the bechamel sauce. Bake in the 350°F oven for 40 to 45 minutes, or until the top gets nice and golden. 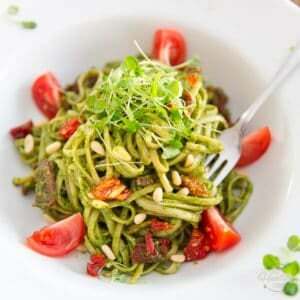 Let stand for at least 10 to 15 minutes before serving; garnish with a handful of chopped parsley, if desired. Wow!…tonight, tonight, better be delicioso! Wonderful! I will give it a try. 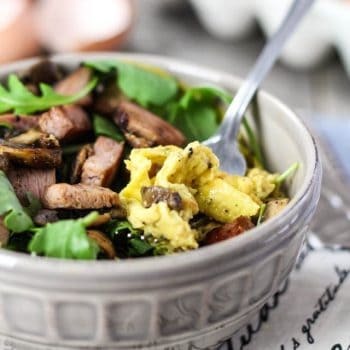 Thanks for sharing a delicious recipe. Yummm! Can’t wait to give this a try! Thank you for sharing ???? Tried this recipe last night for company. It turned out amazing!! It’s a keeper. This looks amazing. 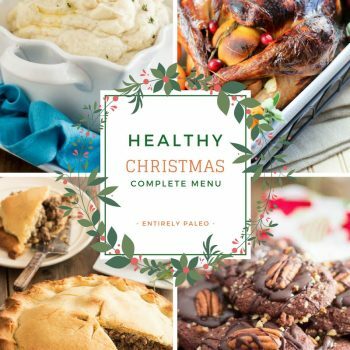 Do you think it would taste okay/have an okay texture if it was assembled, then frozen, and baked from frozen? Not sure, really, but I’d totally try it. 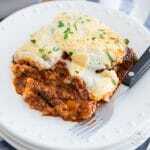 I’m thinking you may have better results with moussaka than you would with standard lasagna!